You have landed on the best page for the latest Waffle House menu prices! Waffle House is one of the largest restaurant chains in the US famous for its waffles, breakfast and American diner selections. Missed breakfast? No problem. The Waffle House also serves a full lunch & Dinner menu. 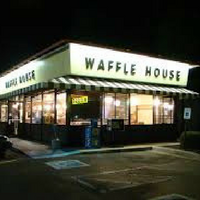 Each Waffle House location is open 24 hours per day, 365 days a year. No need for reservations. No reason to miss a meal. What’s New at Waffle House? You know you are a regular at Waffle House. Why don’t you make it official? Join the Waffle House Regulars Club. Joining is simple and free and you will get coupons, fun stuff, and the latest news delivered directly to your email inbox. Waffle House has been around for 60 years. They don’t like to mess with a formula that works. They are continually adapting to people’s change in tastes. Before a new item is introduced in all locations, it gets developed and tested in their Test Kitchen. Waffle House gives you a sneak peek into what is currently being tested. Feel free to leave a comment. Are you a trivia nut? Always blurting out unusual facts? Check out the Fun Facts page on the Waffle House website and you can learn a lot of interesting stuff about Waffle House. Like the fact that Waffle House serves 341 strips of bacon per minute. You have driven by a location, seen that famous yellow sign and stopped to eat there. Now you can buy Waffle House stuff! Get your own t-shirts, caps, hooded sweatshirts, mugs, and coolies all with the famous Waffle House log. Is focused on returning goodwill to the local communities through a program of corporate giving. The goal is to improve the quality of life in the community through financial and human resources. The Waffle House Foundation will consider helping youth and educational programs, the disadvantaged, health and human service organizations and other civic causes. Works to provide a positive influence in communities where they are located and is accomplished through partnerships, sponsorships, and donations. Contact Waffle House directly to learn more. A cultural icon for 60 years, Waffle House is a fabric of American life, especially in the Southeast. Waffle House purchased and restored the original location in Avondale Estates, GA. Museum tours are available two days a week and reservations are required. Make it a point to visit and step back to 1955 where life was simpler. You can also check out 60 years of Waffle House memorabilia. A job at Waffle House can lead to ownership. Not many places offer that. Visit the Careers page on the Waffle House website to learn about current openings, their training program and their benefits package and ownership opportunities. Waffle House was established in 1955 on Labor Day Weekend in Avondale, Georgia. The concept behind Waffle House was conceived by Tom Forkner and Joe Rogers Sr. They wanted a place that would provide good food quickly all day long. To this day all locations are open 24 hours a day, 365 days a year. By the 1960s, they began franchising new locations across Georgia and the Southeast. Today, there are over 1,700 Waffle House locations across the U.S, with the familiar yellow sign. Waffle House is still a privately held company with headquarters in Norcross, Georgia. The concept and design of each location have remained the same including a jukebox that plays Waffle House tunes. Today, Waffle House is actively engaged in several social media platforms. Be sure to connect and share with Waffle House. For more information about Waffle House, visit their official website. BROWNS,TOAST AND COFFEE…….cOMBINATIONS ARE MUCH MORE ACCEPTABLE OVER PICKING EGGS SEPARATELY ,BACON, TOAST, COFFEE…..TOO MUCH OF A HASSLE. Prices are less than for real ones. Umm yes! Would just like to state the facts from what I’ve gathered upon a recent visit inside your Travelers Rest location. Although the restaurant was busy, it couldn’t have been for the “great” food or the utterly unattractive people that run this establishment. And as far as I’m concerned the restaurant and people who left these stupid comments (excluding myself) are a bunch of freak in losers. Thanks for letting me share. Why are you so hatefully rude????? You must find pleasure in being rude to make yourself feel better!!! Possibly, Mommy issues?! I will Pray for you. Time 5:00 AM, 3-2-16. Not a happy woman. They overcharged me for my orders, the orders were wrong when I got them home, The quality of the food was terrible. I have generally had good experiences at Waffle House, but this one was terrible. I would not recommend this location to anyone, very disorganized at best. Its worth the time to drive a few miles to the Apex location. Steer clear of the Fuquay location. Just a note, I went to this one before and it was bad as well. I though I was saving time but ended up wasting time and money both. I don’t recommend the Waffle House in Jasper located off of industrial blvd near Carl Cannons. I have been there 2 times not impressed. Very disorganized. Waitresses generally ignore customers. Got a carry out this time. When called told it would take 20 minutes. I arrived about 15 minutes after call . Cook actually sneezed on the grill in process of making mine. The bacon was left out. So the omelette sit and waited on the bacon and as a result I got a cold omelette and cold hasbrowns. There wasn’t but one or two people in the place when I went in so I didnt understand why it took 25 minutes to make a cheese omelet even though about 5 minutes was for the bacon left out. It seems everytime I go to any waffle house and order the same thing I always get a different price. Then I discovered when I left that there were no napkins and no fork and knife for the carryout. very disappointed. Totally rediculous pricing for Togo drinks clearly states on the menu 1.75 and I got charged 2.50. The price should match the menu. It really no problem because I don’t have to go back. I have no experience and they hired me as grill cook. Should i be worried. I like to cook .Well they train me. ? As a former Waffle House waitress and cook; under Bailey in Fayetteville NC, I am appalled by the services customers are receiving lately. Cooks still get minimum wage and waiters and waitresses still get tips. You who work for Waffle House should remember where your pay comes from. I worked on interstate I-95 where it was always busy. We always found time to clean especially those big grease catchers above the grill, joke and smoke. Never never order eggs as a menu side item. A waffle and 2 eggs cost me over $8 without coffee. Eggs retail for $2 dozen. Waffle House is charging $3.60 for 2 eggs. Give us a break!!!! I guess I will have to order the All Star breakfast for $7.50 which includes the waffle & eggs and throw away the bacon toast grits that come with it. It would cost less than just my waffle & eggs. Your cook will spend time cooking it and it will not get eaten cause I can’t eat that much food. Fix your egg prices. 4 eggs and a side of bacon X2 =$23.00? Only 2 customers in the store, including me. I’ll start going somewhere else from now on!